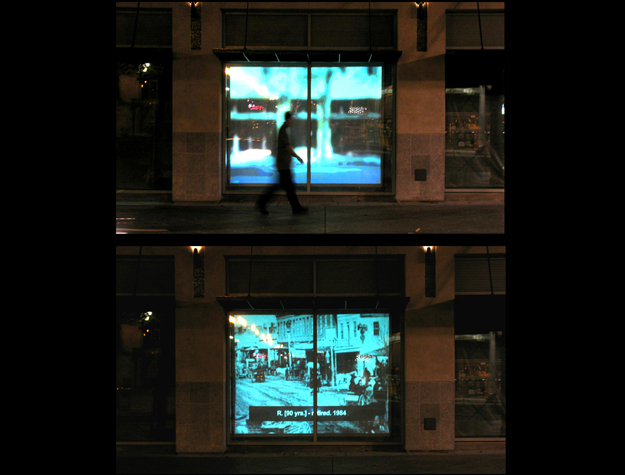 Downtown Mirror, a collaboration with artist JD Beltran, was an award-winning year-long installation at various sites in downtown San Jose, California, from 2007-2009. JD interviewed denizens of the downtown San Jose area about their random thoughts and set them to short films about the area, which were displayed in storefronts.The thoughts from the San Jose public created a revealing, fascinating, poignant, and sometimes humorous portrait of both the individual and the demographic of the city. The constantly changing content drew many viewers to the work. Also a part of this overall piece was "Downtown Mirror [Airplanes]." 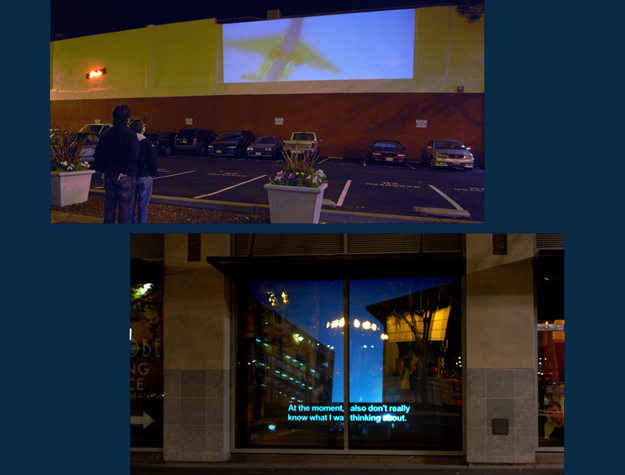 Footage of the ubiquitous passing airplanes that populate downtown San Jose was projected 44' wide by 16' tall onto a building exterior on Fountain Alley. In "Downtown Mirror [Airplanes]," viewers also experienced an interactive sound element; upon entering a narrow "sound corridor" they actually heard the roar of the airplanes (yet this sound was not detectable even a few feet away). In 2009, "Downtown Mirror" was recognized as one of the top public artworks in the country by the Public Art Network (the only organization judging and recognizing public artworks in the United States).